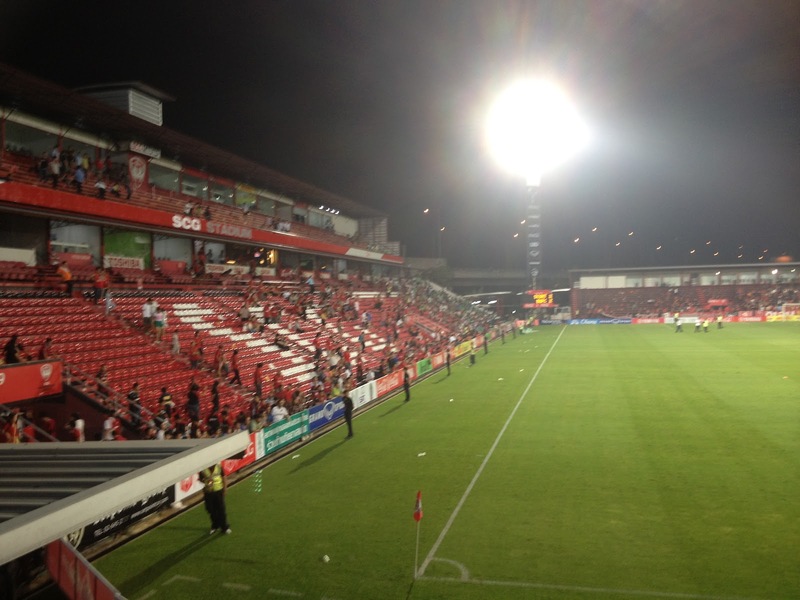 SCG Muangthong United FC, is a major football club based in Nonthaburi to the north of Bangkok in Thailand. The club were formed in 1989 under the ownership of Siam Sports Syndicate. 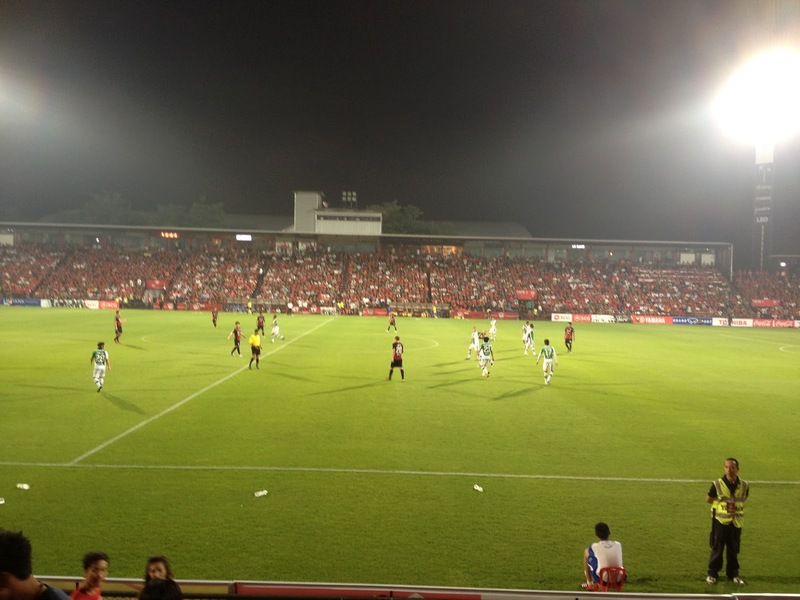 The SCG, which the club add in front of their name is to acknowledge Siam Cement Group who became major backers of the club in February 2012. 'The Twin Qilins' joined the third tier of Thailand football in 2007, winning the title in their inaugural season and gaining promotion. United built relationships with both Arsenal and Lierse to assist with their development. 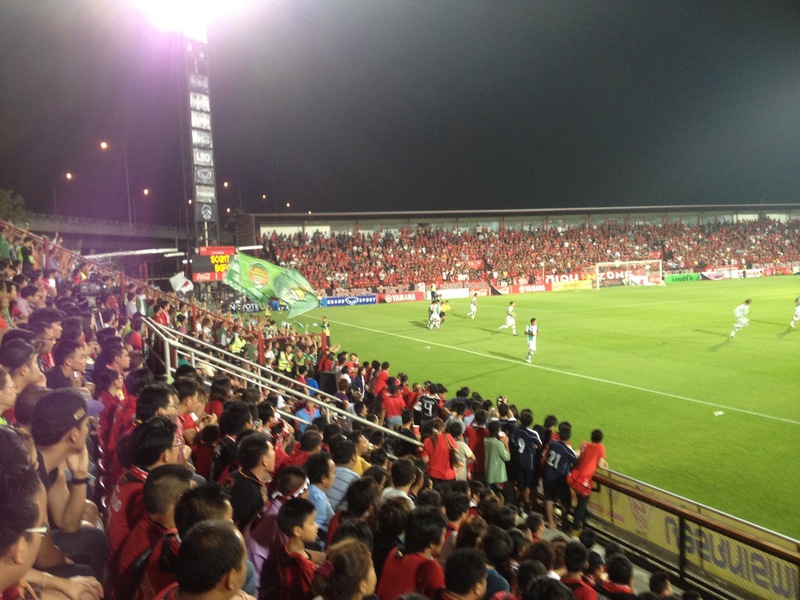 In 2008 they lifted the Thai Division One title at their first attempt to win promotion to the Thai Premier League. Players were recruited as significant sums of money were pumped into the club. 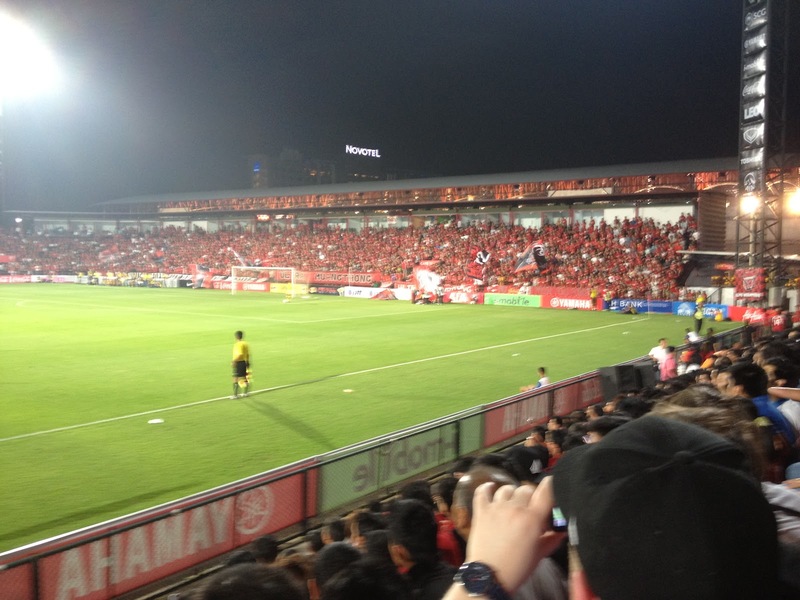 In their first two seasons in the TPL, 2009 and 2010, Muangthong were crowned champions and therefore entered the Asian Champions League. 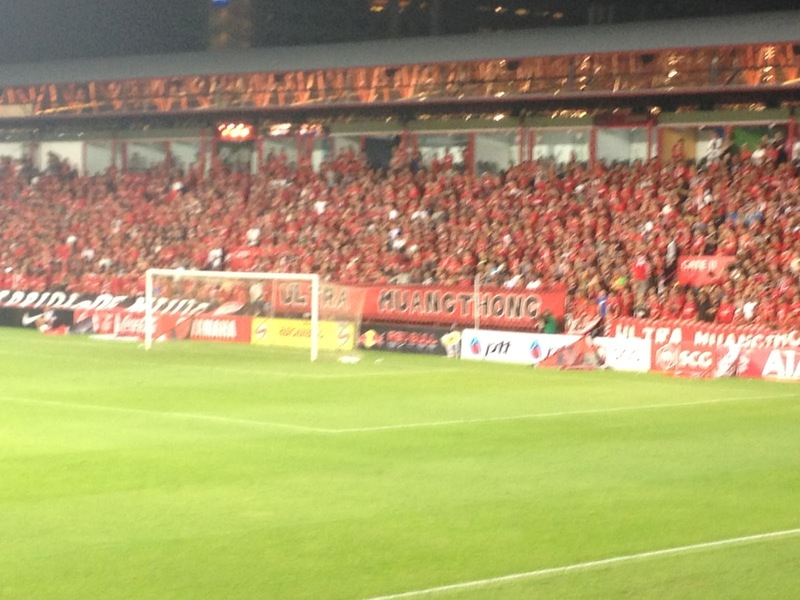 In 2010 and 2011 they lifted the Thai FA Cup, with Robbie Fowler as part of the later squad. The club built their own stadium in Pra Ket by the expressway, which was unusual in Thailand as it had no running track. Originally called Thunderdome Stadium, then Yamaha Stadium it became the SCG Stadium at the same time as the sponsorship deal. In 2012 the former Red Star Belgrade, Chelsea and Serbia star Slaviša Jokanović joined the club as head coach as he led the side to the 2012 TPL title. Thai international forward Teerasil Dangda was leading scorer for the third consecutive season in 2013 as MTU finished in third spot under the tutelage of Belgian coach René Desaeyere. 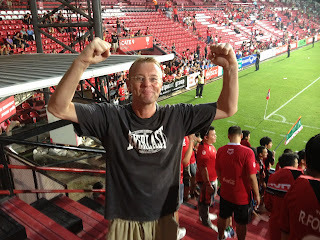 Scott Cooper began the 2014 season as manager, but was replaced in June after a poor run of results by Dragan Talajić who oversaw a fifth place finish, which was not helped by a nine point deduction to both Muangthong and Singhtarua following crowd violence between the two set of fans after the derby at the SCG Stadium. Led by skipper Datsakorn Thonglao, the team finished as runners up to runaway champions Buriram United in 2015. 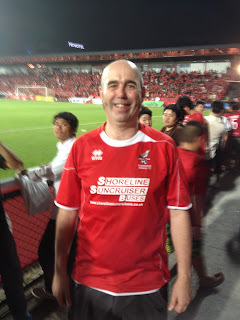 They lost 3-1 to the same opponents in the FA Cup final at Supachalasai Stadium on Boxing Day. Talajić was replaced by Totchtawan Sripan, as Muangthong, spurred on by the goals once again of Cleiton Silva, went on to become league champions in 2016, backing up the triumph by also sharing the League Cup with Buriram United after the final was postponed following the death of King Bhumibol Adulyadej. The team qualified out of the group stages in the 2017 AFC Champions League before going out in the Round of 16 to Kawasaki Frontale of Japan. Meanwhile, Teerasil Dangda was coming to the fore on the pitch, inspiring his team mates as he captained the side. United ended as runners-up in the league in 2017 with Brazilian star Leandro Assumpção leading the scoring after being signed from Sisaket. 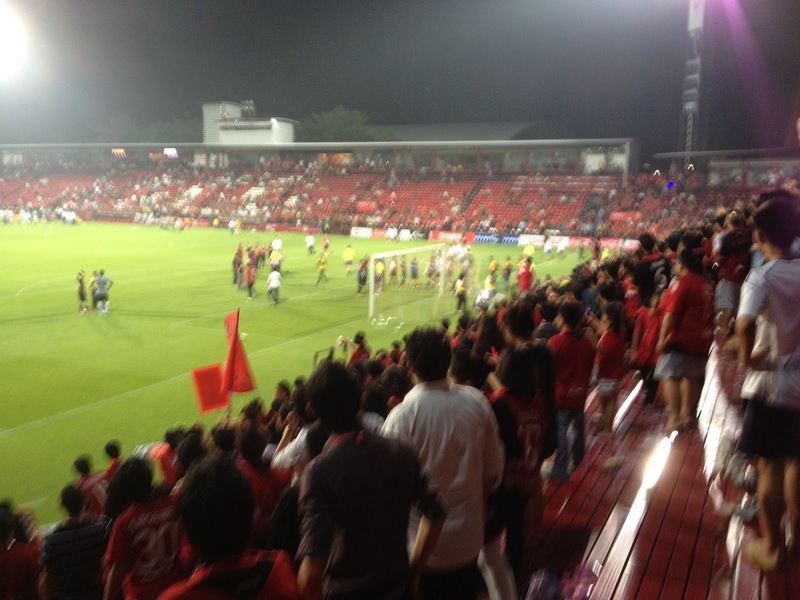 The League Cup was won with a 2-0 victory over Chiangrai United with goals from Peerapat Notchaiya and Dangda. Dangda departed to Sanfrecce Hiroshima as Muangthong ended in a disappointing fourth place in the 2018 domestic season despite the regular goals of Heberty. Sripan was replaced by Radovan Ćurčić in March 2018. Pairoj Borwonwatanadilok was appointed as head coach for the 2019 season. 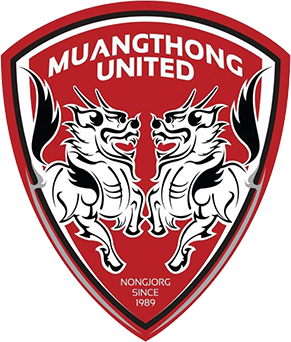 SCG Muangthong United will play in the Thai League 1 (T1) in the 2019 season. 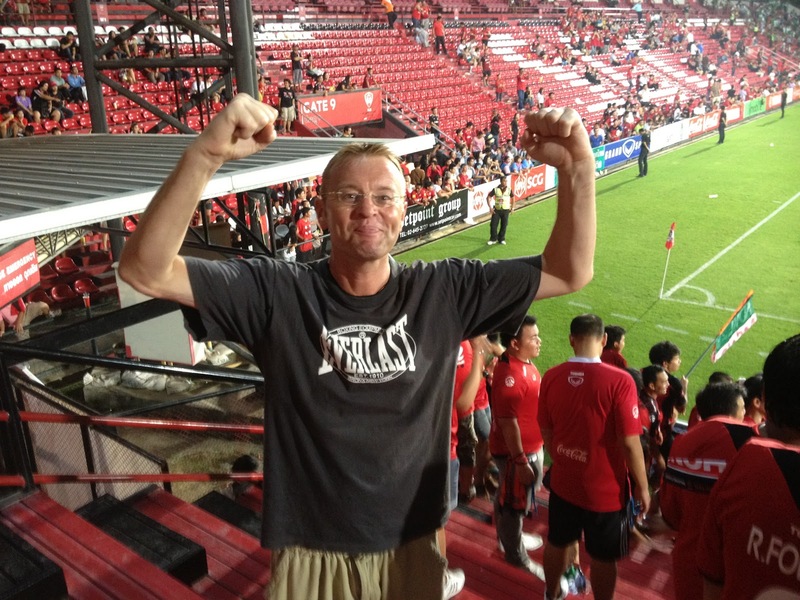 I had been keen to take in more matches while holidaying in Thailand for some time. I had visited the country often enough, but I always found myself busy when matches took place with my cricket commitments. I had taken the plunge through joining Twitter and this tool opened up all manner of information to me. A German/Thai website and Twitter account was most useful. The guys running it gave me regular updated information, which was much appreciated. As luck would have it, there was to be a full midweek programme during the week I had designated for sightseeing and generally doing whatever I wanted. The stand out match was the clash at SCG Stadium. I returned from a lovely time in Kanchanaburi and got back to the Admiral Premier Hotel in Bangkok, where my good friend Steve Walker was awaiting my arrival. We headed round to The Crossbar for another top notch meal and to meet up with old friends before heading off to the stadium. Steve had been with his brother in law Mark and nephew Perry a couple of years previously, but the match was abandoned as the pitch became waterlogged after a few minutes. We walked down Sukhumvit Road to where we thought would be the easiest place to grab a taxi to the stadium. About ten drivers all turned the fare down, and I was starting to get concerned when I pointed to Steve that a car had a MTU scarf in it. Steve managed to get the young driver to wind his window down and ask if he was going to the game? He was, and even better he didn't mind us getting a lift, or at least we think that's what he meant! 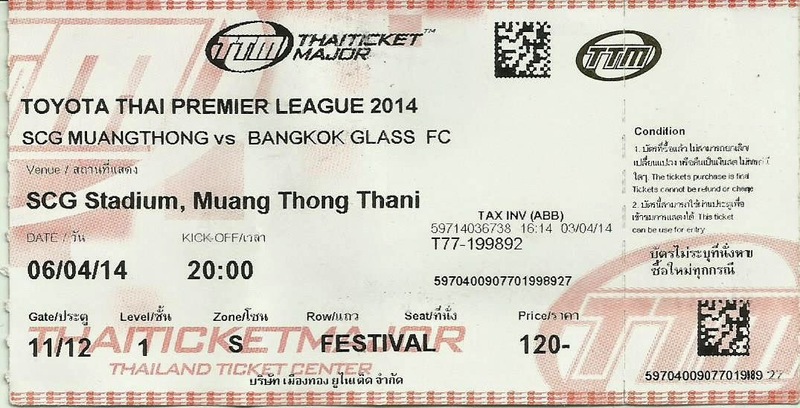 The fan was called Fiat and he lived in Bangkok but had a season ticket for MTU. His English team was Manchester United. Fiat was a true gentleman. He seemed to enjoy his chat with us about football in particular the English Premier League. He explained the reasons why we were being turned down by the taxis. 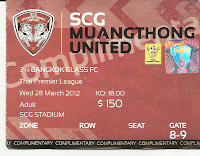 The SCG Stadium was across the road from the Impact Arena, Bangkok's biggest exhibition centre and indoor concert arena. They had put on a gig featuring one of Thailand's biggest names and were holding the Motor Show at the same time as a full house was expected over the road for the football. Steve put it down to typical Thai planning. The traffic was horrendous and at a standstill for much of the journey of around 20km. Fiat was growing increasingly anxious that he was going to miss much of the match. Time was ticking by and we still couldn't see the stadium. At last we crawled down the slip road with the floodlights in view, but the jams were as bad. Fiat told us to get out and go for it. He still had the problem of trying to find somewhere to park his car. He was a legend. He refused any money and wouldn't even take anything for the toll road tariffs. We dodged in and out of traffic to reach the stadium and then the ticket office. Kick off had been put back to allow for the crowds. Steve said we wanted tickets for the South End, which was terracing. He came back shaking his head. We could only get into the Main Stand. I muttered that we'd be in with the old folks. How wrong I was. A young lady took our ticket stubs and stamped our wrists, so we could go back out if we required to use any of the facilities. Our tickets (which I later discovered had 'complimentary' stamped on them!) didn't have designated row or seat. We somehow spotted two seats together and were greeted with warm smiles by the locals. A couple of westerners were in the row in front. More and more fans were coming in and were sitting in the aisles. It was soon apparent that they were selling more tickets than they officially had space for! As for my assumption about the older folk. Well we must have been pushing on for being the eldest there. 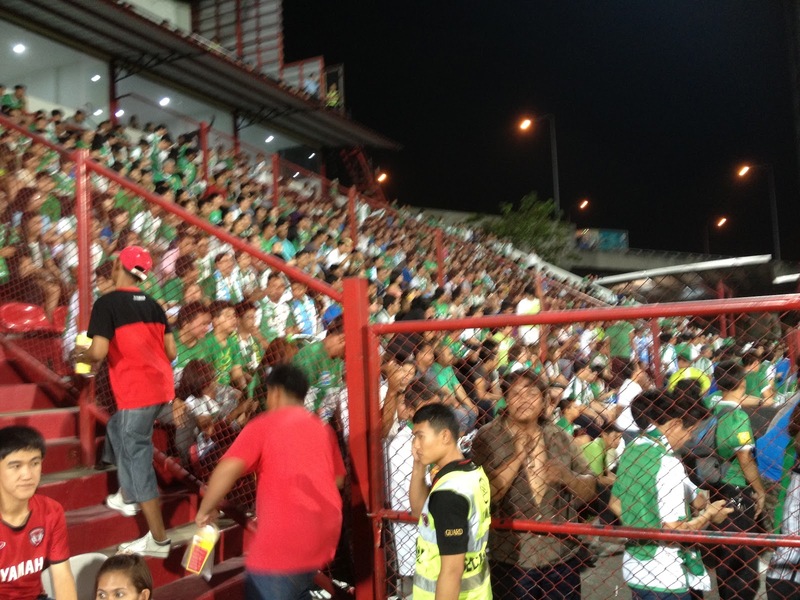 Thai clubs are supported by the new generation who love the way clubs and the leagues try to emulate the European set ups. There were some real youngsters, but the majority of fans were aged between fourteen and thirty year old's of both sexes. They loved making a noise. 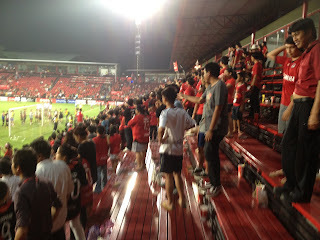 Our seats were virtually on the half way line and cost 150 baht (around £1.80). The stand we were in had a tier of seats with boxes at the rear. On top of those was another deck of seating. Further up the touchline was the away fans section, where we reckoned around 2,500 Bangkok Glass fans were rammed in. 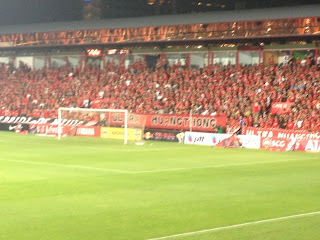 To our right was the South End, which was where the main Ultras stood and made a real noise. The North End was also for standing fans. They were similar to the fans at the other end. Opposite us was the final stand, which joined up in the corners to the end stands and contained the players facilities, press box, TV tower and seating. Every space seemed to be packed. The stewards and security let people sit and stand where they could without interfering. God, it was refreshing. We were expecting a convincing home win and I predicted 4-1, as MTU had hammered Thai Port 5-1 at home in their weekend fixture. However, Glass had not read the script and they played the better of the football. MTU missed an absolute sitter after some great approach play and a lay back, but Glass also created plenty. United spurned another opportunity before the visitors took the lead after a good ball sent the wide man through. He laid it square for Thai international striker Teeratep Winothai to slot home to send 'The Glass Rabbit' fans wild with delight. MTU went in level at the break thanks to the award of a very soft penalty. Dutch forward Adnan Barakat went over a defenders leg in the style of Ashley Young. It looked terrible from our vantage point. He got up and put the penalty away himself. It was at that point I was hoping my prediction would be right, but in favour of Glass. It would also cost MTU extra revenue in the club shop as I was not impressed. 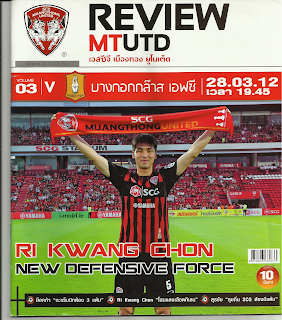 I didn't support any particular side in Thailand, but after that I wasn't going to choose MTU. At half time I went in search of refreshments. It was still very warm despite it being around 9pm. I went behind the away section to get a feel of the atmosphere. There were the occasional 'ferang' (westerner) around, but the demographics were much the same as in our section. 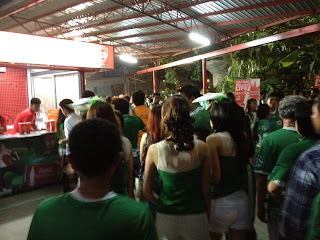 The away fans Bunny Girls Dance Team seemed to distract me from queueing, but I was soon being served two large cups of coke for around 50p. I had to chuckle at the elevated expressway, which was perched near to the away section. It would have led to chaos in the UK amongst those with evil intent. I found my way back for the second half, in which Glass continued to play the better football. Too many players, particularly the Africans on show were falling over far too frequently for our liking. The visitors regained the lead after a clever short corner routine left Wonothai with a free header, which he didn't waste. A fine run and shot from French import Flavien Michelini brought the best out of the MTU goalie to keep them in the game. After gaining more of the control MTU drew level with a fine shot by the Ivorian, Mohamed Koné. At full time we headed to the club shop. There was plenty of merchandise to tempt the customers, all at very reasonable prices at least to my income. 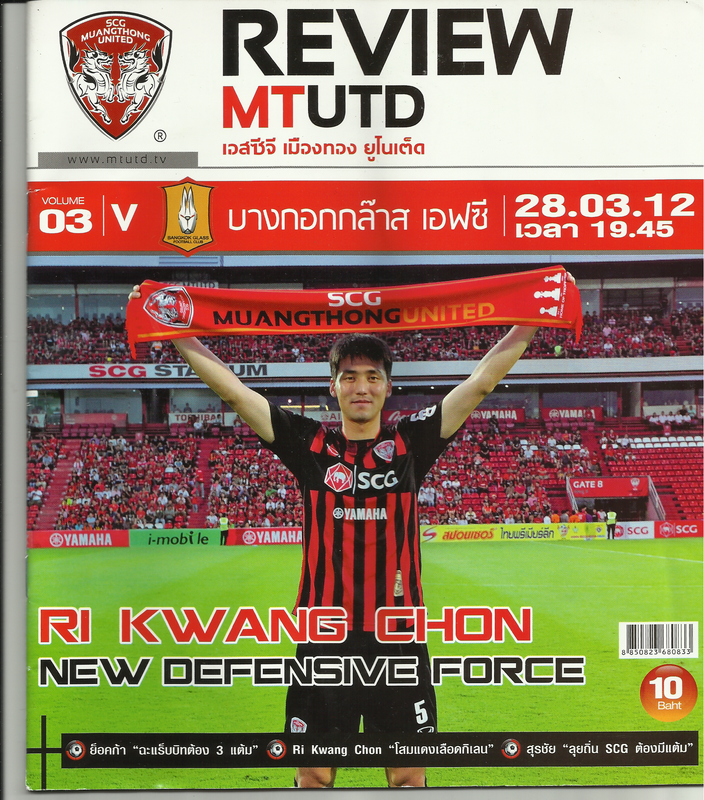 I settled for a couple of excellently produced match programmes at just 10 baht (20p) each. MTU were a bit too like Man Utd for my personal taste. They were slick and professional, but I always did prefer the underdogs. Their style of play hadn't endeared me to them either, although I'd be back to the SCG Stadium like a shot if I was given half a chance. We went into the South End for photos. Most of the crowd were still in, applauding their heroes as they warmed down. We didn't hang around for long as we needed to grab a taxi back into the city. We got one quite quickly, but the driver wanted 400 baht (£8) to take us back to Soi Cowboy. I told Steve I'd pay it. It was well worth it and far easier than standing around for another hour. Within forty minutes we were walking up our favourite little avenue and sitting outside The Moonshine Joint drinking and chatting with pals over for the cricket as well as the excellent Bangkok Post sports reporter Roger Crutchley and bars owner from Newcastle NSW, Steve Hatherall. We sat there watching the world go by drinking multiple bottles of San Miguel Lite with the likes of Gavin Shaw, Lemon, Speed, Woodsy and Matt Luton. I was in a wonderful place that evening! While I always try and visit new grounds given the opportunity, the repeat clash from my previous visit was an ideal fixture with an 8pm kick off. It was the day on which I’d returned from yet another magnificent Chiang Mai International Cricket Sixes and I arrived after enjoying the North Bangkok v Chamchuri United Regional League clash which had a 4pm kick off. My driver took a most unusual route before we drove along bank of the Grand Canal, cutting along and dropping me off to the south of the Impact Arena. As with my first visit the match clashed with the motor show inside the arena. There was a section at the top end of the complex open with an indoor market and food court in which I popped in for a look. The crowds built up on the walk up to SCG Stadium. I was examining the stadium diagram and the ticket office to see where I fancied sitting when a young lady inside turned the boards round. The read ‘all tickets sold”. This was most alarming news. At the same time a girl tried to return an unwanted ticket. I helped her out immediately. She was happy taking 100 Baht (around £2) for a 120 Baht ticket behind the goal. 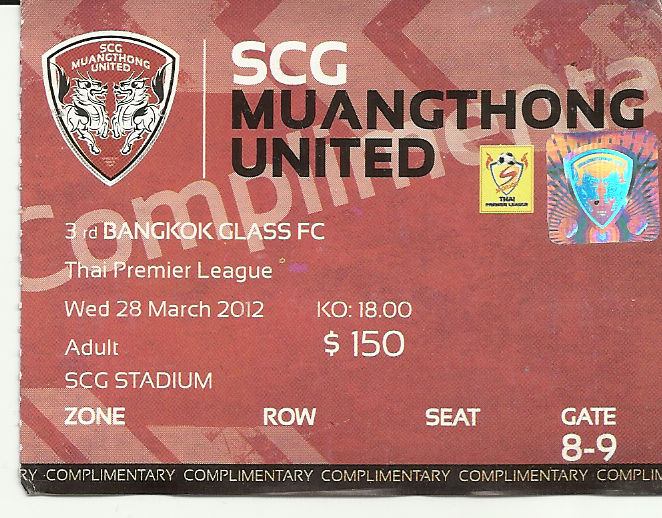 I had noted that a VIP ticket was 500 Baht, which I maybe should have considered. At last I felt like a beer so I enjoyed a large Leo before going inside. The ticket had no specific seat so it was a mater of first come first served. I grabbed a position near the corner, half way up as the home ultras at either end put on a fine display of banners and singing. They tried very hard to replicate European fans. The home crowd went berserk as they saw that Buriram United had conceded a late goal to draw at Saphanburi. The fans of the Glass Rabbits filled their normal section so they were given another block as well as a section on the top tier. It really was an incredible atmosphere. 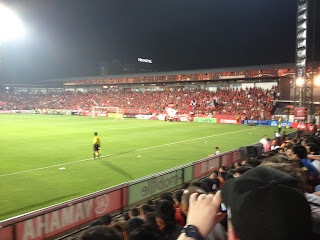 As the teams entered the pitch I realised that ex Cardiff City and QPR (amongst many other clubs) striker Jay Bothroyd was playing up front for Muangthong, who I must admit to not being their biggest fan before kick off. The fans were OK and the stadium excellent, but they had a bit too much commercialism about them. The way some of their players threw themselves around in the corresponding clash in 2012 didn't endear me towards them. I also had to chuckle at the strap line by the museum that read that their history never ends, and a banner at the far end reading ‘Welcome to Hell’ in an attempt to intimidate visitors. They’d presumably never been to Goole? I tried to watch the game totally impartially, but I could see what was coming after just two minutes when Glass full back Jose Mena was booked for a tame foul on Bothroyd. United powered forward and were given able assistant from the referee and his linesmen. Glass defended well with the charismatic Narit Taweekul in goal. Gradually the visitors started playing some good stuff of their own as they spread the play and frustrated both the United team and their supporters. The Frenchman Flavien Michelini was excellent wide on the right. 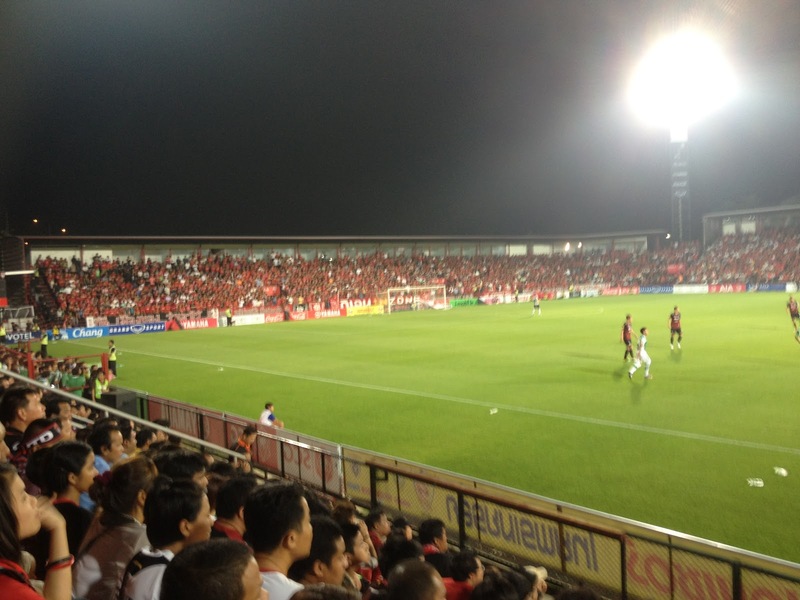 Bothroyd had started brightly but then disappeared for long periods. Glass took the lead with a fine move finished with a header from Chatree Chimtalay on twenty five minutes. I did my best not to cheer too loudly! Visiting skipper and ex United player Teeratep Winothai who had a youth career at Crystal Palace and Everton was roundly booed. He looked like a fine player, as someone of 51 international caps should. He was booked and then sent off in injury time in the first half. Neither were particularly bad offences. Just after his dismissal, Muangthong equalised. The only shock to me was that the ref hadn’t awarded a penalty or scored it himself. As it transpired it was left to Korean defender Dong-Jin Kim to nod home after a mighty scramble. Half time came at a good time for a stretch and a drink. The temperature was still in the thirties as nearly all the players of both sides gave it everything. I took up a seat in the gangway for the second period to enable a bit more legroom. Individual seats had been added behind the goals since my previous visit, without much thought for anyone over six feet tall. Michelini went off after ten minutes of the second half after receiving some rough treatment. The game was there for the taking for the home side after the best two Glass players were out of the way. They gradually turned the screw, which led to Bothroyd finishing delightfully on sixty three minutes. The bloke had oozed class when he appeared bothered in a microcosm of his career. I didn’t reckon he deserved the fawning the westerners were giving him from the stands. United came close on several occasions to add to their lead. They looked a very decent side. It was a shame of the way the match had gone as it promised to be a classic when Glass were at full strength. The visitors nearly grabbed a stoppage time equaliser as panic spread in the home box, but it wasn’t to be. The away fans took defeat an awful lot better than I’d have done in their shoes outside the ground, with lots of smiles and handshakes. Thais really are wonderful people. I received a further illustration of this fact as I tried to flag down a taxi. I’d gone over the main road near to a massive car park to try and get first go at a cab. 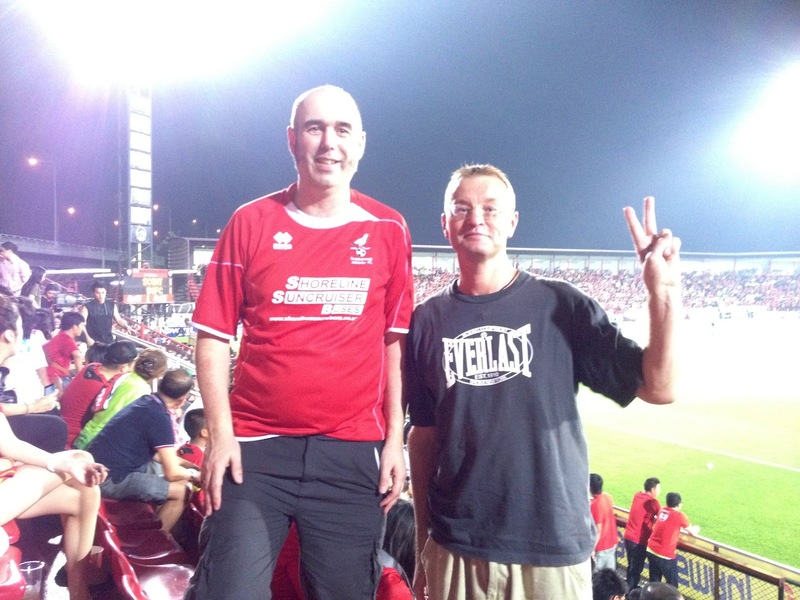 A couple of drivers knocked me back before a man in a Muangthong shirt asked where I needed to go? He quoted me 200 Baht, which would have been what I expected to pay by the metre so I gladly accepted. 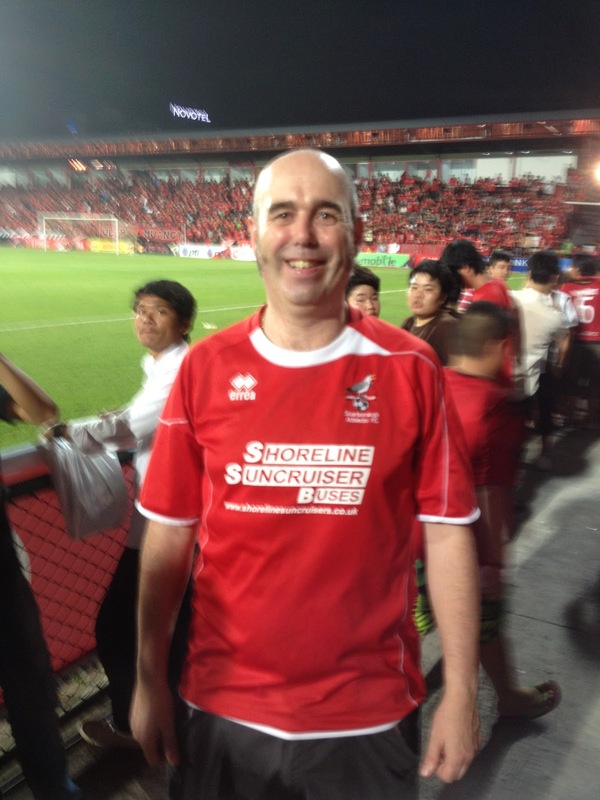 He was an off duty taxi driver who was delighted a westerner had gone to watch his team. We managed a basic chat about the game and the TPL. He showed me a picture of his young son who he was obviously very proud of before dropping me off exactly where I needed to be to pick up some supper. It had been a cracking evening out, even if the game didn’t go the way I’d have preferred. 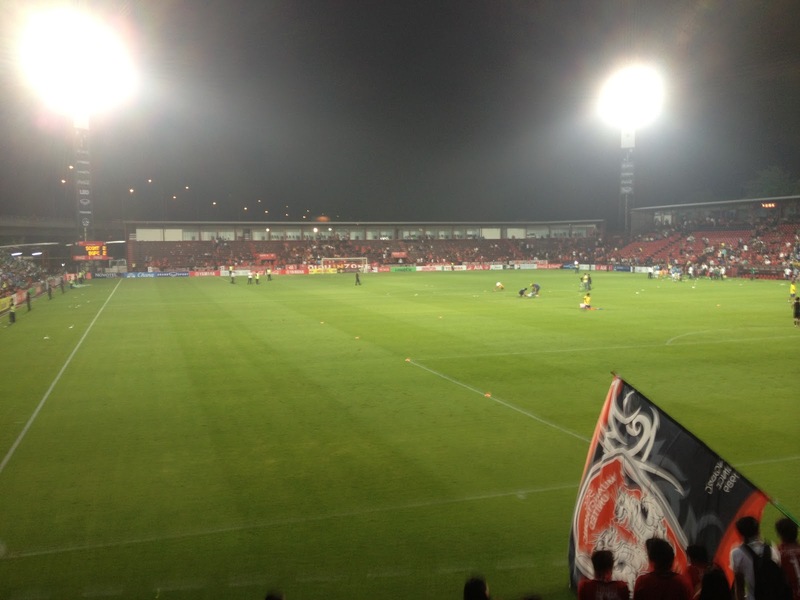 Muangthong United had got an awful lot right. It’s just that they were just not entirely my thing.